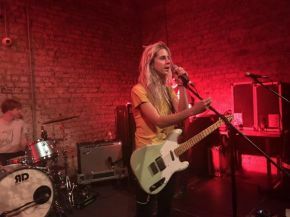 Buyers Club in Liverpool played host to a hard hitting night of music this past Friday as Bully played the third date of their UK tour. Blasting through their set, it was a solid hour of punk and grunge rock, as lead singer Alicia and the rest of the band played an eclectic mix of their 2 albums, Feels Like and Losing. The crowd was rocking and there was a small mosh pit at the front which was quite awesome and added to the great atmosphere. Highlights of Bully’s set included their lead single Trying, from their debut album Feels Like, along with Trash. When it comes to their second album, Kills To Be Resistant is a top favourite. Alicia’s signature growl filled the space with a perfect echo through the crowd, it sounds great on Bully’s albums and even greater in person. Bully are one of those bands that sounds just like the record which makes for a fantastic live experience that I think even new listeners to their music will be able to feel, not just hear. Supporting Bully on their UK tour are Seattle based rock band Dude York, with several albums under their belt, they played a great handful of songs, highlights were the appropriately titled Put Your Phone Down and The Way I Feel. Dude York did a fantastic job of warming the crowd quite nicely for Bully. Also playing a supporting role on this occasion, were UK band Lola, they played a great selection of original songs and also a rocking cover of Valerie, some may say that The Zutons have been outshined by Amy Winehouse with her version of Valerie, but Lola played to their strengths with their own rocking rendition of the hit song. It was a brilliant and unforgettable night of great rock and 90s grunge vibes, hopefully Bully return to the UK again as an opportunity to see them live is definitely one worth seizing.